By Dan Ambrose: It seems like almost no one thinks former six division world champion Oscar De La Hoya (39-6, 30 KOs) would stand a chance against IBO/WBA middleweight champion Gennady Golovkin (33-0, 30 KOs) is the 42-year-old De La Hoya makes good on his comeback talk of returning to the ring to fight the power punching Golovkin. One fighter believes that De La Hoya will give Golovkin a lot of problems in the ring, and that’s former WBA lightweight champion Brandon Rios. He likes De La Hoya’s experience, boxing skills, and his courage in a fight against Golovkin. To be sure, Rios isn’t saying that De La Hoya would necessarily beat Golovkin, but he thinks he’s still good enough to give him a lot of problems with his skills. It would be very difficult for De La Hoya to make a good showing in his first fight back in seven years by taking on someone as good as Golovkin. It’s a crazy idea for a fighter to come back after all those years and immediately go to the top to face the best guy. We’ve seen it done successfully on rare occasions, but not with guys that have been out of the ring for as long as De La Hoya. Heavyweight George Foreman returned to the ring after a 10 year absence and was eventually able to capture another world title in beating Michael Moorer by a 10th round knockout in October 1994. However, it took Foreman seven years and 29 fights before he was eventually able to win the world title. In 1991, Foreman lost to IBF/WBA/WBC heavyweight champion Evander Holyfield. Instead of giving up like many fighters would at his age, Foreman kept fighting until beating Moorer at age 45. De La Hoya doesn’t have the kind of punching power that would make him successful at middleweight like Foreman did in the heavyweight division. 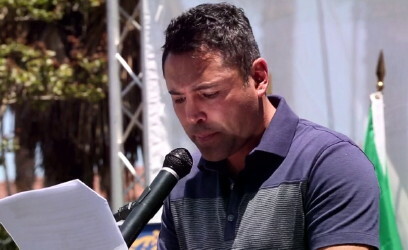 But if De La Hoya was serious about his comeback, he would take a lot of tune-up fights like Foreman did in order to sharpen his game, and improve enough to where he’d have a better chance when he did eventually fight for a world title against someone like Golovkin. Age isn’t just a number; it’s a real thing, and if 42 like De La Hoya, then chances are that you’re not going to have the physical tools that you did in your early 20s. Age is very important in sports, especially boxing. That’s why there are so few fighters still in the game by the time they reach their 40s.